Discussion in 'Muslim <---> Christian Dialogue' started by iRock, Jun 14, 2013.
or 1 man for left weight and 2 woman for right weight are balanced because Allah : " the male shall have the equal of the portion of two female "
or 1 man for left weight and 4 woman for right weight are balanced because Islam allow 1 man can have 4 wives . 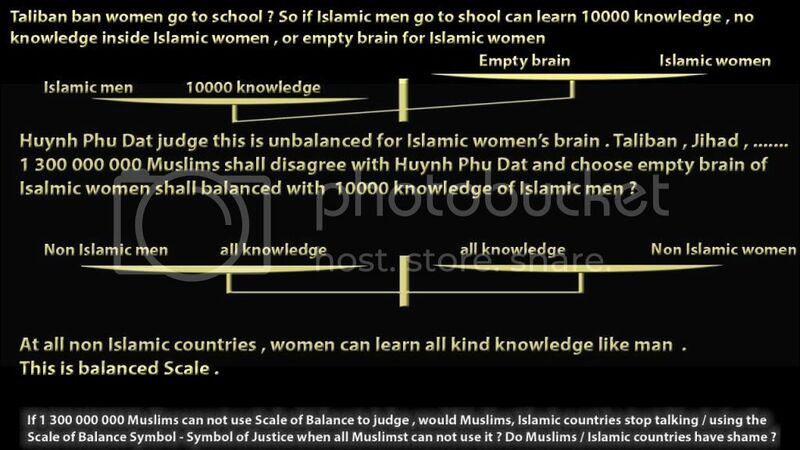 or 1 muhammad for left weight and 22 wives for right weight are balanced because 1 300 000 000 Muslims in this world accept , love , like muhammad , this is The Balance inside the Brain of 1 300 000 000 Muslims . What is the rate Muslims here will choose ? This is also a judgement for Islam too . Show me , Huynh Phu Dat what Muslims have . I'm not sure I understand all your points, so please take this as comment rather than a reply. This is true of rulings on inheritance. The status of women in Islam is often misunderstood. Equality is a difficult concept, because men and women are different, and often women are given higher status than men because they are women, so no, this is not Equality. Men and women are, however, equally obliged in worship, equally required to pray, give charity, make pilgrimage. Men and women are different, but neither is better or more than the other. I thank you for your interest in our faith, and encourage you to read more to become more knowledgeable of it. Sorry Hassan . I'll back in some day , 1 or 2 days . I need to solve some problems . Thank you for your reply . You can read the link of gawaher I give you , the Admin of gawaher have a good view about this problem . The Admin of Ummah gave up when he face up to me , bad Islamic forum when they could not protect Islam . 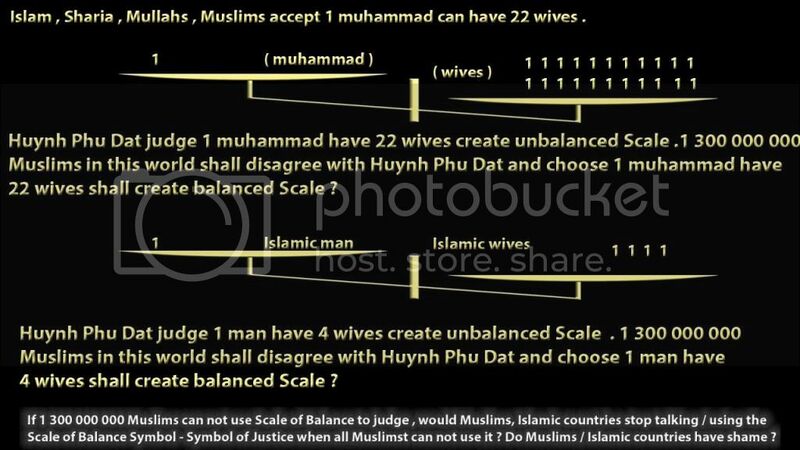 Huynh Phu Dat really interesting with Muslims in gawaher.com and turnintoislam.com because none of Muslims can have enough courage to confirm “ on the Scale of Balance ,1 Islamic man on left weight equal with 4 Islamic wives when Sharia allow 1 man can have 4 wives or 1 muhammad can have 22 wives are balanced “ . Where are your courage ? When man A / Muhammad eat food , food give man A / Muhammad energy = 220 J , man A / Muhammad shall use 220 J to love their wives , 220 J are value of love of man A / Muhammad . Man A / Muhammad can live 220 years with their wives . When man A / Muhammad live with their wives , man A / Muhammad do 22 times act A , 22 times act B . When man A / Muhammad go to bed with their wives , they love their wives and man A / Muhammad do 22 times act C , 22 times act D when they “ love “ their wives . Man A have 1 wife , Muhammad have 22 wives . So love of man A with 1 wife is 220 J , he do 22 times act A , 22 times act B . When he “ love “his wife , he do 22 times act C , 22 times act D . Man A live with his wife 220 years .All things of man A on left weight of the Scale of Balance . 22 act C /22 wives = 1 act C for 1 wife , 22 times act D /22 wives = 1 time act C for 1 wife . With 220 living years , each wife of Muhammad can have 10 years living with Muhammad . 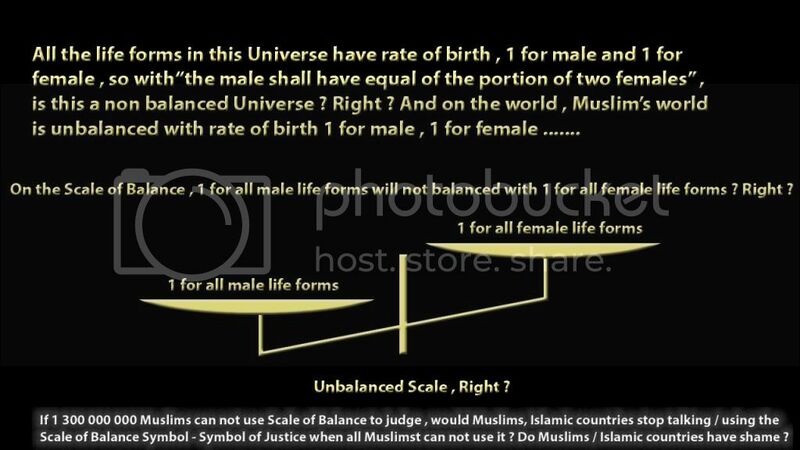 All things of Muhammad on right weight of the Scale of Balance . After Admin of gawaher.com and staff of turnintoislam.com continue to protect Islam , Huynh Phu Dat will talk about “ insult Islam“ and the Scale of Balance , Islamic court , Sharia and Scale of Balance . 22 wife * 220 = 4840 J , this love of all wives . If muhammad stand in front of 22 wives , he only give 10 J of love for 1 wife . I think Mullahs always good , and Dr Zakir Naik , wow , he is really good Muslims . I dont know (or maybe i dont understand) what is your question, but i can tell you math is not the answer. And even if *some* men (muslims and not muslims) dont agree with women reaching education services, islam encourages everyone to learn and seek knowledge; up to what level, is a personal matter. Is true (in my opinion) that in poligamy, one wife gives 100% dedication to her housband, while the housband gives half dedication if he has two wives, or a quarter if he has 4 , BUT these marriages need first to meet some rules and regulations + none is forced (or better say none should be forced) in such marriage, so if a woman agrees and she is happy i dont see what are the other peoples problems, sure we have more important things to ponder on. iRock, we do not understand your question. What are you asking us? 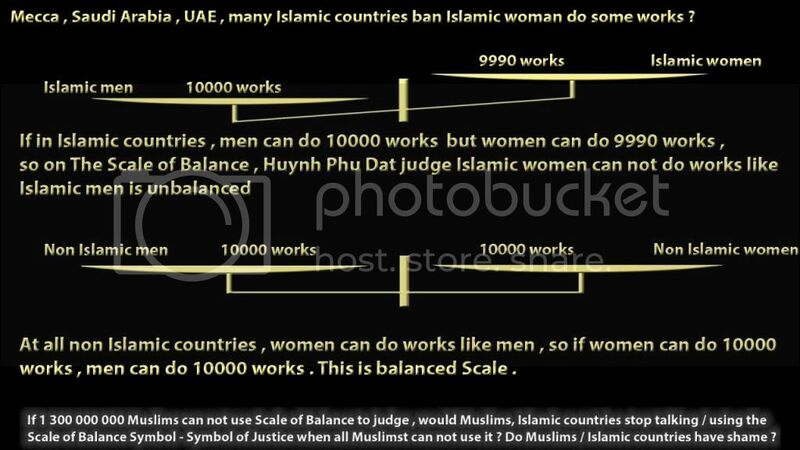 This scale of balance is not of Islam, it is not making any sense to us. You were already given explanations here, and on other sites, but seem to ignore them. That you think this is a 'battle' is worrying. If you cannot clarify your question, we cannot even begin to answer and I shall have to close this topic. Yes , perhap not battle but a debate . But if we talk about the energy , why don't you tell me about the balance between men and women . When 22 women stand in front of muhammad , all things become complex . Can the love by J unit muhammad can give to his wives = love by J unit 22 wives give to muhammad . Can you tell me ?
" I dont know (or maybe i dont understand) what is your question, but i can tell you math is not the answer. @Hajjer : No math in Islam ? But if you don't accept math is good so 1300000000 Muslims can stop use matrh in their life . Rule must bring into Scale of Balance first to judge the balance of that rule , the balance must reach to each word of that rule . Yes , perhap not battle but a debate . Perhaps not even debate but conversation. This site is not for debating. No math in Islam ? The sister did not say there is no math in Islam, she said maths is not the way to answer your issue. Love is not measured in Joules. I have never heard of any way to measure Love? If a man has one wife, the man has to provide her with a home and all the love and affection she needs, this is much the same as anyone's concept of marriage, though we have clearer rules about what the man's rights are, and what the woman's rights are. If the man cannot fulfil the woman's rights upon him, he is not allowed to marry a second wife. If he can fulfil them, he may take a second wife, but only with the permission of the first. The first wife has the right to be the only wife. If a man has two wives, the man has to provide them each with homes and all the love and affection they each need, and they each have the same rights upon him. To get to four wives, each having the same rights upon the man, yes, I find it difficult to think about also. But this is what is permissible in Islam, and not what is obligatory. I hope this improves your understanding some. Love is emotion of human . When you feel in love or when your body work or do something , of course your body will need energy . And energy is J . When you love , it will cost energy or you think love will not cost energy ? When a couple in bed and do something , it will cost energy too . If 1 man have 4 wife and live 80 years , he can live 20 years with 1 of 4 wifes . If 1 man have 1 wife and live 80 years , he can live 80 years with his only 1 wife . if 1 man can have 4 wife , the value of wife is cheap . The love her husband can give to her is cheap too , and J is a tool to measure love . But you can choose a wife have 20 years to live with her husband have a greater value than wife live 80 years with her husband because " maths is not the way to answer your issue. " But on the Scale of Balance , 80 years will heavier than 20 years .
" If a man has one wife, the man has to provide her with a home and all the love and affection she needs, this is much the same as anyone's concept of marriage, though we have clearer rules about what the man's rights are, and what the woman's rights are "
So if 1 man 2 wives , each of wife have " half of love of man " and everything belong to 1 of 2 wives are half of everything belong to their husband . That is a rate , 1/2 for 1 wife . If This man have 1 wife , all thing belong to him can belong to his wife , the rate is 1 and 1 > 1/2 . But you can choose 1/2 > 1 because " maths is not the way to answer your issue. ". But on The Scale of Balance , 1 will heavier 1/2 . Why all of you choose to protect " things " can contain the unbalance ? Why do not choose to protect "things " can contain 100% balance . Right now I think really not good about Islam , even when muhammad can only have 4 wives , on the Scale of balance , muhammad on left weight , 4 wifes on right weight , Muslims here all choose this is balanced !!! Even a man have 4 wives , the value of 1 of 4 wives still = the value of the only wife if this man have only 1 wife , this is the balanced thing Muslims choose on the Scale of Balance ? The value of wife : 1 wife is 20 years and 1 wife is 80 years . If 1 man has 4 wives and lives 80 years , he can live 80 years with 4 wives. If 1 man has 1 wife and lives 80 years , he can live 80 years with his only 1 wife. Which wife have high value ?I think if 1 man can have 4 wife , the value of wife is cheap. Any wife has high value. Greetings, apologies to iRock for intruding on his thread, please forgive my intrusion iRock. Hassan with the greatest respect to you I ask how can you make a statement such as this when there is much evidence and belief amongst muslims to the contrary? If its a proven fact of history that Mohammed did have more than the allowed four wives, you cannot pretend that this was not the case but maybe instead put forward reasons as to why Mohammed felt the need to break Our Gods rules, or Allan's rules..as it was never a rule of Yahweh's . No man is allowed five wives at one time, not even Prophet Muhammed (peace be upon him) was allowed more than four at one time. One reason put forward. Then one would have to reason why Allah would give special dispensation to one man. If Allah was indeed a fair and just God would it be beholden upon Allah to behave so? It should be noted that the special exception to the prophet concerning the maximum number of wives [Qur'an, 33: 50] includes also special restrictions on him and his wives from privileges available to all others. For example, his wives as "mothers of the believers" were not allowed to remarry after him [Qur'an 33: 53]. If the Prophet were required to divorce wives beyond the maximum of four, it would have done them injustice; to be divorced and disallowed to remarry. Furthermore, for each of the Prophet's marriages there was a specific lesson, social or legislative. By divorcing some of his wives, those lessons are effectively negated, especially the unifying function of marrying women from different clans and backgrounds. This diversity allowed close observation of his private life and teachings and communicating them to their respective folks. Also, unlike any ordinary Muslim, the Prophet was not allowed to divorce any of his wives and marrying others [33:52]. 1 wife : 1 wife "
You will need a clock to count each sec this man can stay with her husband . So let iRock judge by the Scale of Balance . On the Scale of Balance , there are only 2 state : balance and unbalanced . 1 man on the left weight and 4 women on the right weight . If Muslims here choose 1 man on the left weight equal/balanced with 4 women on the right weight . The state of Scale of Balance is balanced . So it's meant the value of 1 man = the value of 4 women . Or the value of 1 woman = 1/4 the value of a man to make the Scale balanced . I - Huynh Phu Dat can not understand it . 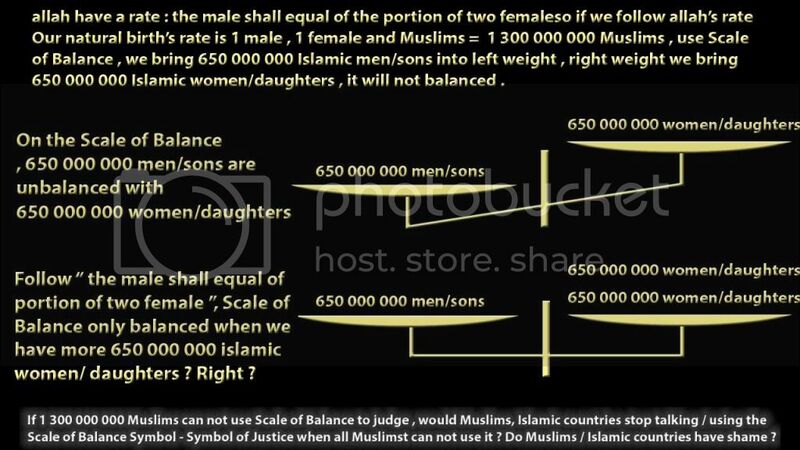 If Muslims here choose 1 man on the left weight is not equal / unbalanced with 4 women on the right weight of the Scale of Balance , the Scale of Balance is unbalanced . I - Huynh Phu Dat can understand it . On The Scale of Balance , there are 2 state only .
" maths is not the way to answer your issue. " Do you intend to use this thing more ? I still cannot understand the purpose of this thread. So, what is the purpose of this thread, iRock? And the maths actually doesn't make sense. Are you trying to put faith on the same level with maths? Also, whats/whos Huyunh Phu Dat? Some sort of philosophy concept? Abu Loren Defender of Islam! I have a question, who came up with this "scale of balance"? Why does it have to be 1 man to 4 wives? Islam also allows for a man to be married to just one wife! And Br. Hassan already explained to you, there are conditions that must be met for a man to take on a second and third wife, so not every man can have multiple wives because they cannot meet those conditions. And yes, whether you agree with it or not, math is not the way to address this issues. If there is something you do not agree with in Islam, then come right out and ask it.